Use the Section element to create a background, and then overlay text, buttons, and any other elements on top of the background. The Section Element has plenty of great features, such as the ability to set it's minimum height, the ability to add a background and the ability to add other elements into it. You can find out more information about the Section Element by clicking the button below. How to use the Section element to style and structure page sections. Since the Section Element is a containing element, you can add other elements into it to create content over your image or video background. It is also possible to vertically align this content on the Section Element to let you customize this to your liking. 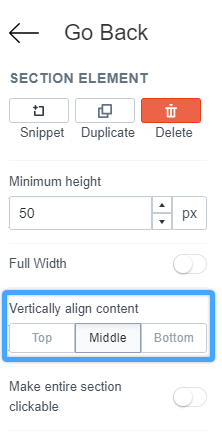 The Section Element has a great feature to vertically center your content within the element. You can find this option in the right-hand menu of the Section Element. Note: The Section element was previously known as the Box Background element.